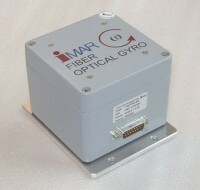 The series iOLFOG angular rate sensor is re­al­ized as an open-loop fiber optical gyroscope measuring rotation rate with high pre­ci­sion. used for automatic vehicle guidance (forklifters, AGVs), ship motion con­trol etc. Compared to other gy­ro­scopes the optical gyro­scope has the ad­van­tage of very low noise, short reac­tion time, high reso­lu­tion, accel­eration in­sensitiv­ity and unsur­passed robust­ness. iOLFOG-S-D provides both a com­pensated di­gi­tal output (CAN or RS232/422) and an compensated ana­log out­put as an option. The iOLFOG-S-D comes in an rug­ge­dized alumi­num housing and con­tains the fi­ber optical sen­sing unit with ex­tra long fiber coil fol­lowed by high so­phisti­cated analog and digital signal proc­essing. The output deliv­ers an analog output sig­nal proportional to angu­lar ve­locity. The inte­grated micro-proc­es­sor re­duces the nonline­arity less than 0.2% f.s and compen­sates the bias on the digital and analog out­put over tem­pera­ture. As an option an input for an addi­tional incre­mental enco­der is available for appli­ca­tions in vehicle guid­ance. In sum­mary the iOLFOG-S-D is cre­ated as a "plug & meas­ure" an­gular rate sensor of the medium preci­sion class for easy handling.